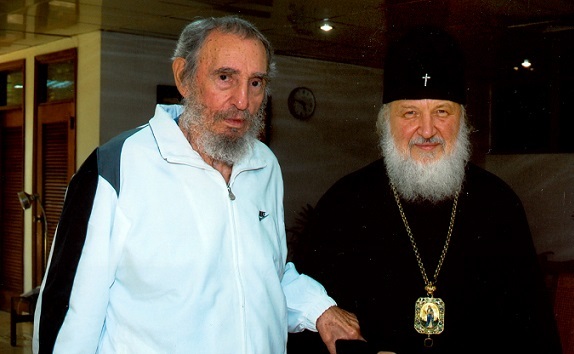 Moscow, November 28, Interfax - Patriarch of Moscow and All Russia says he will always remember Fidel Castro, who was not only a legendary person, but a true friend of the Russian Orthodox Church. “Comandante Fidel was one of the most well-known and prominent state figures of the present time, enjoyed international authority and became a legend when he was alive. He was from the flesh of the Cuban people and focused his force on gaining true independence for his Motherland and giving it a worthy place in the family of nations,” the patriarch said in his letter of condolences to the head of the Cuban State Council and government Raul Castro. “I keep the warmest memoirs of my meetings with Comandante Fidel. I was always impressed by the grandeur and acuity of his mind, ability to speak competently on various topics,” Patriarch Kirill writes. In the mid 2000s Castro approved of building a Russian Orthodox church in center of Havana and Cuban people built it on their own money. This February a historic meeting between Pope Francis and Patriarch Kirill was held in the Cuban capital.